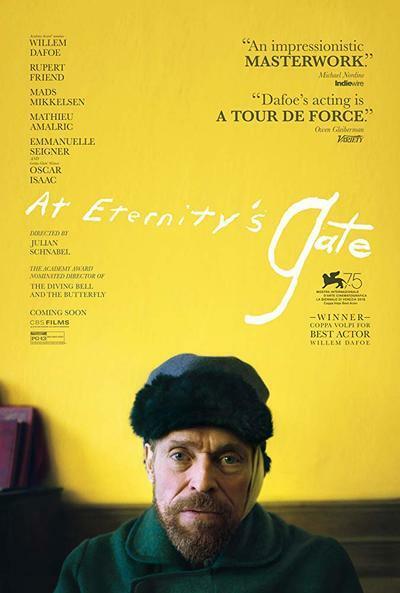 “At Eternity’s Gate” is a fascinating fusion of a trio of artists: subject Vincent Van Gogh, performer Willem Dafoe, and filmmaker Julian Schnabel. Far less concerned with traditional biopic beats that seek to hit the high points of a famous life, the director of “The Diving Bell and the Butterfly” delivers a film more interested in philosophy and process than product. And rarely has a film been more of a singular showcase for a performer. Schnabel’s camera is often moving and often in close-up, as if the filmmaker is trying to find the magic in Dafoe’s performance in the same way that Van Gogh tried to find the magic in a landscape he was painting. Concern over simplistic details like inconsistent accents and the fact that Dafoe is a quarter-century older than Van Gogh was when he died don’t really find a home in “At Eternity’s Gate.” This is not that kind of movie. It’s an impressionistic film, concerned more with the atmosphere around genius than explaining it away. Like a series of paintings, “At Eternity’s Gate” takes an episodic approach to its subject’s life, focusing on his final years, often distracted by madness and underappreciated by the world around him. Van Gogh has colleagues like Paul Gaugin (Oscar Isaac) and his brother Theo (Rupert Friend) around during some of the better days of this final period of his life, but he often seems to succumb to something greater and unseen, including a self-understanding that he wasn’t quite made for this world. In one of the film’s best scenes, Van Gogh tells a priest (Mads Mikkelsen) sent to judge his sanity that he believes perhaps God made him “a painter for people who weren’t born yet.” Did Van Gogh really have this much of an understanding of how rarely great art is appreciated in the great artist’s lifetime? Art historians can debate that more accurately than myself, but it’s an underlying theme of Schnabel’s take on a man too often reduced to the story of his ear. Schnabel paints Vincent Van Gogh as something of an anomaly in his own time, an outsider to the entire world almost because he could see it differently than anybody else. While Dafoe’s performance consistently fascinates and elevates the film overall, there were times I wished Schnabel would catch his breath in terms of the scene after scene of the "deep philosophy of art," and the filmmaking becomes too self-aware in the second half as Schnabel repeats dialogue and layers images on themselves in an attempt to replicate madness. Dafoe doesn’t really need those crutches. The best scenes in the film are the ones in which we see Vincent Van Gogh staring out a landscape or up at an unforgiving sky, asking questions about why he’s so different and then using that difference to create beautiful art. Those are the moments when it feels like we are seeing and hearing the voices of all three artists in the film at the same time, the moments that come closest to capturing the eternal possibilities of art.